In Ep. 007, Tim and Brendan do a deep dive into the world of investing apps. They give a brief overview of the different types of apps out there, and discuss how to determine which one would be right for you. They also talk about three apps that were specifically asked about by a listener: Acorns, Stash, and Betterment. If you’ve been thinking about opening an account at one of these apps, you’ll definitely want to check out Ep. 007! Enjoy! Tim: Welcome back to Living With Money. This is Tim Mullooly. Today here with me is Brendan Mullooly. Brendan, thanks for coming on. Brendan: Happy to be here. Tim: Filling in for Tom on this episode. We touched on today’s topic, Investing Apps, at the end of the Good Debt vs. Bad Debt episode. If you missed that one, go check it out. It’s on our website, and on iTunes, and all over the place. 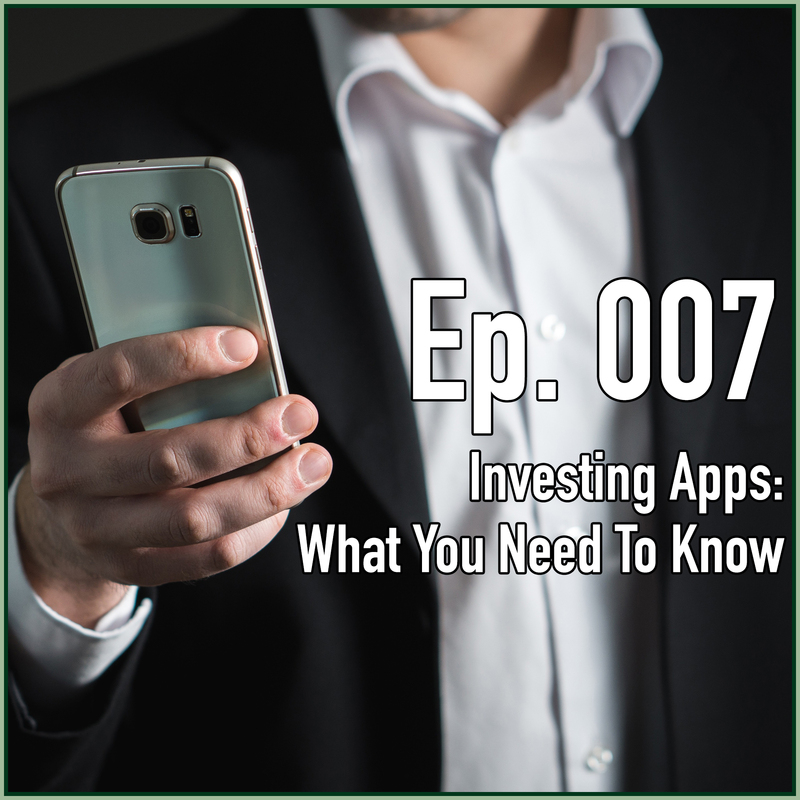 We figured, after touching on it briefly there, there was enough to fill a whole episode, so we figured that we would kind of fill this whole episode with information about these investing apps, because there really are a lot out there, and they’re not all the same. So, with that let us kind of work our way into a broad overview of the different types of investing apps, because, like I said, they’re not all the same, and I think people don’t understand that sometimes. So, Bren, paint a picture of the spectrum of investing apps out there for people. Let’s just take only the investing side and create another spectrum, because within the investing apps you have one end that is focused more on trading stocks, individual companies, and the other end of that spectrum of investing is there are different apps that are more focused on diversified portfolios using ETFs, or mutual funds, or whatever. We just covered a ton of ground right there. I mean, as a lay person coming into that, it’s like, “Sure, I’m in the personal finance section of the app store,” but what are you trying to do, like what are you looking for help with, and that’s going to lead you towards different ends of these spectrums that we’re discussing right now. Tim: Right, because you don’t want to download one of these investing apps that’s going to put you in a diversified portfolio if you want to be constantly trading it, picking stocks. You’re going to get pretty frustrated. Definitely, say, do some research on these apps before you download it and, also, do some research on yourself and make sure that you have your expectations, or the purpose in mind for this app before you download it, and make sure that your goals are clear, and your expectations are in line with what the app can provide you. Brendan: Some of the apps that are out there give us a blend of what we just talked about, so you might have an app that has savings features that help you to identify what you can save, or how you can save, and then they’ll also help you get that money invested appropriately, but there are some out there … You don’t want to go into like the personal finance app and be looking around for where you’re going to like trade your stocks, or whatever, because that’s not going to work out. Just do your homework on the apps and learn what they’re really focused on. Each of them tends to have some kind of a niche, whether it’s the saving/investing blend, or one or the other. It’s important to know what you’re getting into. You’re going to do that by identifying like, “Am I saving, and if so for what?” What are you saving money for? Brendan: Exactly. Some of these apps will help you with that. Some of them won’t. Again, like these apps are created for different people, different audiences. You have to also do your own homework on your end to know which app is going to be a fit for you, and then maybe you learn by downloading a couple of them and then just like poking around in there, user interface. That’s fine, too. Tim: Like we were saying. If it’s for savings, you need to determine what it’s for. Same thing with investing. If you’re going to invest … I always say that there’s a big difference between trading and investing. Two different words that get used interchangeably sometimes, but the ultimate goal is completely different. Tim: You can just let it run. Brendan: … for fun, or for fun, yeah exactly. That’s fine. I don’t have anything against that, but in those circumstances you’re probably going to gravitate more towards an app that’s going to let you buy shares of Nike, because you wear their shoes, or Starbucks, because you drink their coffee, or something, or whatever. You’re doing research on companies that you like, or you’re trading penny stocks or something. I don’t know. You have to be honest with yourself, and like Tim said, there is that dichotomy between investing and trading. It’s not like we’re saying right or wrong here, because for different people … It’s going to be different for everybody. Tim: We’ll kind of just move into pros and cons of these different apps. Let’s start off on a more positive note. What are some of the pros that you see with these investing apps, to put a blanket over it, in general? Brendan: Well, the first pro that comes to mind is the reason that we’re having this podcast, they generate interest, and especially from young people. The fact that these apps have been created, and they’re getting people interested about their money in whatever capacity and whichever end of the spectrum they fall on, I think that’s great. Tim: We say it all the time. Time is the biggest advantage investors have, so young people getting started early in the market, or in saving money, creating good habits to build on over their lifespan, think it’s definitely a pro. Getting younger and younger people interested, investing, and just learning about how the markets work and saving money and seeing some benefits from that. Brendan: Just to piggyback off that with another pro is low barrier to entry. We’ve all downloaded apps on our phone before, so You know how simple it is to pick up your phone, download an app, and start learning how that app works. By creating these apps for things like personal finance, or investing, saving, whatever it may be, it’s turned money, let’s just say, broadly, into something that people feel they have access to, which is not always the case. A lot of the finance industry has stigmas of putting the gates up and only wanting to work with the ultra-wealthy, or things like that, and these are bringing concepts, and access, to things that people previously maybe didn’t have, especially young people. Brendan: You’re not getting a diversified portfolio. Tim: Exactly. There’s no way that you’d be able to do that years ago, so the technology of these apps is really introducing some of these concepts that people wouldn’t be able to participate in until later in life, it’s allowing them to get started in it earlier with less amounts of money, because a lot of these apps there’s no sort of account minimum. You can start with zero dollars. A lot of big firms say that you need a quarter of a million dollars, or whatever, to open and account, but these apps, like we were saying, is a low barrier of entry, so you can start with as little as zero dollars with some of these. Brendan: The final pro that I want to bring up is that it’s allowing people to learn lessons, and I don’t mean that they’re all going to be positive. Part of this whole learning by doing, I guess, is what I’m describing. There are going to be bad lessons, like people might do foolish things with their money, but they’re going to learn, and I think there are some things in the world, and maybe investing falls into this category, that you can only learn by doing, and experience is going to be a great teacher for some people, whether it be positive, negative, or in between, it’s going to be a lot of both, I think. Tim: It’s one thing to read about a certain topic, but it’s a totally different thing to actually do it. Brendan: It’s a good way to get started, doesn’t mean that everyone is going to have results is what I’m trying to say. Tim: It doesn’t mean you’re a failure. Brendan: … it doesn’t mean you’re doomed forever. It’s important to, I guess you have to be self-aware to learn the right lessons is, I think, what you’re getting at. Tim: Right. Self-awareness in knowing expectations in terms of pros and cons of these apps is just something to keep in mind for this entire process of choosing an app, seeing results, and understanding the process in general. So, now that we’ve covered some of the pros, let’s talk about some of the cons that you see with these investing apps. Tim: There’s one big one. Brendan: … probably once a day, if not more in some cases. It’s great to have this stuff on your phone but, at the same time it can really hurt you, too, especially for those who are using these apps for long-term investing is exactly who I’m thinking of with this. If you’re checking in on your retirement account every single day, I think it’s going to drive you insane. If you can do that and not be affected by it, more power to you. Tim: I don’t know many people out there that can do that. Tim: Not much is changing on a day-to-day basis, and it doesn’t matter. Along the same lines of overstimulation and having too much information, a lack of guidance with these apps, meaning that you are kind of your own. No one’s really there to break down what you’re looking at on your phone for you, so you kind of need to be able to digest all of the information and be able to understand it, to be able to make better decisions. Thinking of the everyday person, people that aren’t in the industry might have some trouble deciphering what they’re looking at, and what information is important, and what they need to actually know. Brendan: … failing and that they need to do something about that, because it’s broken, or something’s wrong. It may be the case, may be not the case, probably not if it’s a retirement portfolio. Another situation I can think of is, if you’re putting money into an app to invest in, there’s not a lot of guidance in terms of like, can you afford to save this money. I just worry about people putting money into the market that shouldn’t be in the market. That happens with regular online accounts anyway. People aren’t always getting the guidance they need to be making smart decisions. I don’t want somebody’s emergency fund 100% invested in stocks I guess is what I’m saying, but there’s no interface on most of these apps that is going to say, “Hey, don’t do that. You should have an emergency fund.” You are kind of on your own to have these basic concepts down. “Alright, I need to have some money set aside, and above and beyond that I’m going to invest it, and it’s for this.” You need to reach these conclusions on your own. Tim: Unless you’re working an advisor it’s going to happen anywhere that you have an account. It’s definitely intensified more on these apps. You know, one thing that I found is the fact that you can … Based on the information that you input into the app, they give you a recommendation as to what portfolio, or what type of investments would be best for you. I have a slight problem with that, because you can always go in and change your answers, or change the information that you give the robo-advisor, so you can kind of manipulate the system to change your risk tolerance, is what I’m saying. If you want to be aggressive, because you see that the market’s going up, and then the market starts going down, the robo-advisor won’t let you change your allocation, because you said you were aggressive, but then you go in and change your risk tolerance from aggressive to conservative, you can pretty much do whatever you want. The whole lack of supervision thing kind of ties in with that, because there’s no one really to stop you from making those decisions, which could ultimately hurt you in the long run. Brendan: Again, those are decisions that are also enabled if you just have a self-directed account online that you’re doing on your own. Tim: … on those apps. Brendan: … if you’re working with a professional that they are keeping you focused on what matters, and that person, or that roadblock, or that resource, that you go to in times of trouble, or with questions does not exist, in most cases, on these apps. Some of these apps have access to a call center where you can speak with a professional who, I would hope, gives you good solid advice. Yeah, so it’s not built in. It’s not there in the app. There’s nobody popping up inside of there to tell you not to freak out when the market’s down, and you’re investing for retirement that’s 30 years away. Tim: We’re going to take a quick break, but when we come back we’re going to talk about some specific investing apps that were asked about, so we’ll be right back. Tim: Okay, so now that we’ve talked about giving you kind of a broad overview of the different types of apps out there, and the pros and cons about using these apps and what you should think about in terms of setting goals, and setting expectations, and being self-aware, we’re going to talk about a couple apps here that were specifically asked about from one of our listeners. We kind of wanted to break down how the apps work, and if it is right for you, or not. The first two apps we’re going to group together, because they’re very similar. The apps are Acorns and Stash. Brendan: Yeah. These are kind of, I would put them in the category of combination saving and investing apps. Tim: On the spectrum that we were talking about before, they kind of fall in the middle, because they’re not just an investing app, and they’re also not just a saving app, but they help you do a little bit of both. Brendan: Yeah. I think the reason that there has been such an interest in these two, especially, is there is a bit of like a novel concept here where I think the unique feature is that they’re rounding up from purchases on your credit or debit card to send money into an investment account automatically for you, right, Tim? Tim: Right. That’s the case with Acorns. You connect your debit card. Anytime you make a purchase it rounds up to the next dollar and takes that change, invests it into, or puts it into your Acorns account, which then gets invested into ETFs. They buy fractional shares, obviously, since you’re only putting in a small amount of change each time. With Acorns and Stash, you can deposit different amounts of money whenever you feel like it, so it’s not just from the debit card rounding purchases that your accounts can be funded. That feature isn’t available actually with Stash, so for Stash you need to actually put money into your account, so you need to put $100 a month, or something, or start with some sort of lump sum, and go from there. You can set up recurring investments, either daily, weekly, or monthly. Same thing with deposits into the account, as well. Brendan: Both of these apps are giving you a broadly diversified portfolio of exchange-traded funds, so they wouldn’t be for somebody who is looking to trade stocks. Tim: Exactly. Like what you’re saying, this isn’t for the day traders. This is more for people who want to get started in actually investing their money. Brendan: One unique thing that I saw about Stash is like it has these diversified portfolios based on risk tolerance, kind of like what we were alluding to in the last segment. Also, they have these specific ones where you can invest based on causes that you care about. You can have green investments, or like tech investments. You can kind of align your interests with your investments, which is a cool way to think about investing and, I think, also something that probably resonates with younger people. Tim: Just going to kind of lay out some numbers here for you, though, for each of these apps. We’ll break down a couple different scenarios, but just something to keep in mind. In terms of the cost for these apps, both apps, Acorns and Stash, promote themselves saying that it costs $1 a month to have an account on their app, so that’s $12 a year. As of December 11th of last year, the average account size at Acorns was $193, and the average account size at Stash was $83. When you hear a dollar a month that doesn’t sound like a lot of money. It makes you think, “Oh, wow, that’s really affordable, I can do that,” but just keep in mind if the average account size at Acorns is $193, and you’re paying $12 a year, plus on both of these apps there’s a 0.12% underlying fee for the funds, obviously, to invest in them, it comes out to, for Acorns, the average cost to investors is about 6.34%. It’s higher than that at Stash, with a lower account size of about 14.5% to investors, which in the industry is unbelievably high. Brendan: … put in, or you make. Brendan: If you’re just going to do it for the sake of it and like not take is seriously then it’s just going to cost you $12. I don’t see a real point in doing that. If you’re only going to put in 100 bucks and like your spare change then I don’t know, I don’t know necessarily if it’s smart. Based on the average account size that does kind of seem like the way people may be using it. Look, they’re not killing anybody by taking their $12 on a $100 account, or whatever, for the year, but at the same time I don’t think it’s worthwhile. You’re not really … It may feel like you’re doing something good because you’re investing, and you’re saving. I would probably try to think about it a different way. I kind have like, especially with like the Acorns style of saving, I have a philosophical difference with how they are presenting the idea of saving. Tim: Do you want to expand on that a little bit? Brendan: The novel concept that I referenced before is that they’re getting you to save and making it pretty painless, because they’re going to round up your purchases on your credit or debit card and just throw it right into an investment account for you, and that’s great. I guess that I would rather see people save in some capacity than in no capacity whatsoever. When I talk about saving money with people, I like to present it more as almost the exact opposite of that, where you think about saving as a fixed expense, like a bill, like your rent, or your mortgage, or the utilities, or whatever, and it’s coming right off the top when your paycheck hits. You want to automate it on that end, so your savings is coming out automatically. Tim: So, it’s not just the scraps, you know. Brendan: You want to treat saving seriously, not just save the leftovers. Tim: Along the same lines, if you think about that, if the only saving that you’re doing is rounding up to the nearest dollar every time you use your debit card, like you have to spend money then to save money, so on a net basis … you’re spending way more. Brendan: Two things that are totally different. Tim: You’re not going to have much luck. Brendan: I’m fairly certain there’s not going to be a lot of money left over to save, so send your savings somewhere automatically at the beginning and then spend from what is leftover, and that’s just a philosophical difference that I have about saving when put against an app like this that’s doing it that way. Tim: Right. If you are saving money right off the bat, like Brendan is talking about, off the top, and you have these apps, Acorns and Stash, then that’s kind of just like icing on the cake. Brendan: Yeah, you know, that’s an interesting way to think about it is like, “I have my regular savings, it’s automated,” and then in addition to that you’re also sending in the leftover money from your purchases. You’re rounding off and sending that in to the same investment account. If you’re using it that way, that’s terrific. Brendan: … some retirement nest egg one day, that’s not how it works, and I hope that people realize that much. Like, if you’re putting in 53 cents a day, or something, from your purchases, yes it’s going to grow in an investment portfolio for you but that’s not how you jumpstart your retirement, I guess is what I’m saying. Tim: Right. I think these apps, Acorns and Stash, both have a very good use. You just need to understand how much you’re going to be paying in fees, depending on how much you put in the account, so you need to just determine for yourself beforehand if it’s worth it, and if you think that it is, then it’s a good way, like we were saying before, get your feet wet and introduce yourself into having a diversified portfolio, but just understand the costs and other things that come along with it. The other app that we wanted to talk about is more of a traditional robo-advisor called Betterment. For their regular program it’s zero dollar minimum to invest. They have a feature called Betterment Premium. That’s a $100,000 minimum to invest, but we’re going to focus more on the zero dollar minimum one. It gives you personalized financial advice. It also gives you access to licensed professionals if you need it. Like we were saying, they have a call center you can call people and talk to a licensed professional that can give you some advice, if you even should be investing, or maybe build up your emergency fund. They help you out with that, as well. Similar to Acorns and Stash, they utilize low-cost index funds. Brendan: I like, too, that Betterment tries to identify, you kind of alluded to this, like what it is the person is saving for. You kind of go through their interface, which is super cool, and you answer questions. This is, obviously, like any other relationship, based on the person being truthful, and that’s true whether-or-not they’re doing this on a computer or with a person, but they try to identify what they’re saving for, and they have different portfolios for different things. If you tell them you’re trying to save for a house and you identify a time frame that you’re doing it over, they’re going to put you in like an appropriate portfolio so that you’re not 100% in stocks with the money that you need for a down payment in two years. As long as you’re honest with the user interface on a program like this, it’s pretty cool. Tim: When you get started … I actually clicked through the website the other day just to kind of get a feel for the process, you input, just to start off, your age, whether you’re retired or not, and how much you make a year. Based on that they bring you to another page where you can select a goal that you have in mind, some of the options, like we were saying, a safety net, retirement, or just general investing, and then based on your age and the other information you gave, they’ll recommend some sort of portfolio, stock, bonds, split, and how it would change over the years as you work towards retirement and change your goals a little bit along the way. It also, it will stop you and recommend that maybe if you have high-interest debt, or something, that you might not be telling them about, that maybe you should do that before investing. I liked that they have those other things in mind, as well, and not just your investment accounts. They kind of take other things into account, as well. At the same time, you’re still on your own. Like Brendan was saying, you need to be truthful, and if you’re truthful with this program, Betterment, it can be a nice tool for people who might not have enough money to go work with a regular advisor. We broke down the fees and costs involved for Acorns and Stash, just to touch on that with Betterment, so you have an idea, their average account size right now, or as of December, was $28,329. Management fees is 25 basis points a year, plus the underlying fees for the funds of 12 basis points a year, so that’s a total of 37 basis points a year to have your account at Betterment. That is not included with the Betterment Premium. That’s a totally different thing from what we are talking about, but just the regular Betterment comes out to about 37 basis points a year, which is pretty cheap. Brendan: Pretty low cost. Those are three different dives into investing apps, so as you can see they all vary in many different ways. Again, this just goes back to the idea of like before you go into the app store, or before you’re downloading this, to like input your bank information to send money over, you need to understand what it is you’re looking for, what you want help with, what your goal is in terms of downloading this, and just go from there. Tim: The technology is there. You just need to have enough discipline and self-awareness to use them to your advantage. If you use these apps the wrong way, you can really hurt yourself. If you’re honest with yourself, you know where your goals are, and you set your expectations, and you do your homework before opening an account, there are hundreds of different apps out there and they can be of great service to you. You just need to use them properly. Tim: If you’re listening to this on iTunes, please subscribe to the podcast to get new episodes every week and feel free to leave us a review, or a comment, because it would really mean a lot to us. Be sure to follow us on Twitter and Instagram at @LWM_podcast for more news and updates about the show. Hopefully, you found, or heard, some information on this episode that’ll get you thinking about what app might be right for you, if at all. Thanks for listening to this episode of Living With Money, and we’ll see you on the next one.